As a kid, the last day of summer vacation was the most boring day of the year. Sometimes my family would take a trip for the summer months and I would be excited to get back to school and tell my friends all about my adventures and hear about theirs. If my family did not take a summer trip, it would mean that I did nothing all summer. I hung out with my neighborhood friends, biking around, and getting myself into childhood mischief. Every day we would watch a movie at one friend’s house, play video games at another’s, and maybe play board games at some other friend’s house. Some days we would pretend to be cool and try to do tricks on our bikes and skateboards. I usually ended up with scrapes, bruises, and torn clothes if I was lucky and a broken bike if I was not. By the last day of summer, I would have exhausted everything of entertainment value I or my neighborhood friends could come up with and therefore I would stay at home. I would drag myself from room to room complaining about how bored I was to any parent who would listen. By the last day of summer, my parents would have bought me all my new back-to-school supplies I needed or wanted. I would have notebooks with matching textbook covers, scented erasers, markers of every color, pencils, pens, rulers, and a compass I would never use. Most of which would be lost within the first month of school. So happy to go back to school. My new uniforms would be crisply pressed and hanging orderly in my closet. My brand new school bag would be packed and everything was ready for the first day back to school. Even though I would have never ever admitted it when I was a kid, on the last day of summer, I was dying to go back to school. Mark and I woke up early on the very last day of our summer vacation. We weren’t going to sit around the house being bored. We were going to a Brazilian themed amusement park. If you close one eye and squint the other, it almost looks like Disneyland. Parking at Brazilian Wushuzan Highland was free. I thought that was very unusual for a theme park. 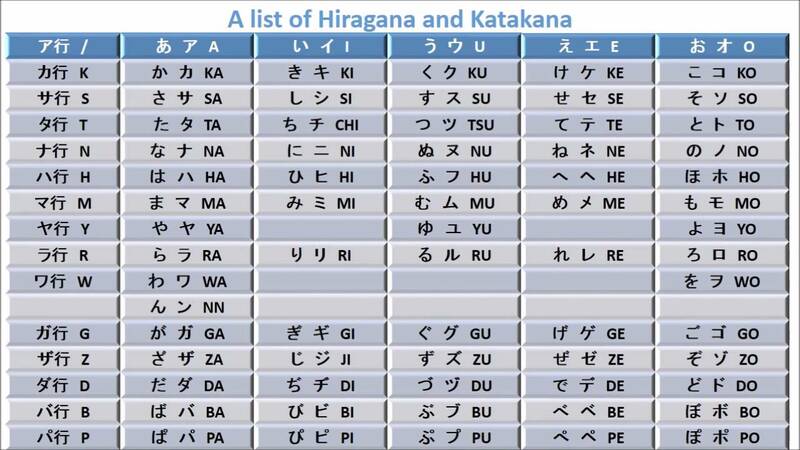 It’s also very unusual for Japan. In this country, there is very little free parking. We parked the car and walked to the ticket counter. There was a line of 3 people and there were 2 people selling tickets. “Are we early?” I looked at the opening hours. The place opened at 9:00. It was now 10:00. This one is definitely closed today. Mark and I had coupons which made our tickets a little over $20 each. The lady at the counter pulled out a map and a black marker. She said, “Today. Closed.” Then she proceeded to cross out all the roller coasters but the Turbo Drop. “What’s left?” I asked. She smiled and pointed to the Ferris wheel, the tea-cup ride, the pool, and a few other rides. “One o’clock bingo,” she said handing us a couple of bingo cards. “Enjoy!” she said as she waved goodbye. We’ve been climbing these stairs for 2 hours now! As soon as we got inside the park Mark headed to the Turbo Drop. “They might close it too, if I wait too long!” We climbed a set of stairs with no visible end in sight. We got to what we thought would have been the top only to find another set of stairs, and then another. Mark is the only guy on the ride. Mark rode on the Turbo Drop a few times. There was no line for any ride, so people could just go on a ride again and again and again. We did a few smaller rides and then we got on the Farris wheel. The guy did warn us that it would be very windy at the top of the wheel. But we got on anyway so we could see the whole park. Once at the top we started to feel frighten. It was very windy. But, although everything in the park looked rusty and old, the Farris wheel held up. From the wheel we could see the whole park. It was not very big and there weren’t many people walking around. There were about 5 people in the pool. Then we saw that the Sky Bike ride had just opened. That’s where we went next. Mark and his new Brazilian BFF. Throughout the park “Brazilian” music played on loud speakers. Every other song was the Lambada, or a Lambada remake. Also on rotation were, “The Macarena”, a generic carnival song, Simon & Garfunkel’s “El Condor Pasa”, and a random Shakira song. I think there were about 9 different songs, 3 of which were versions of “The Lambada”. There was no line so, we just walked up the Sky Bike and got on. We fastened our flimsy seatbelts and peddled our way through the ride. We stopped several times to take photos. Marked posed for me this way and that way. “It’s a good thing I saw that.” I said. Then I looked at the belt. Did it really matter if it was buckled or not? The belt was not tight around Mark’s or my waists. If one of us fell, we would probably fall through the belts. With this new insight, the very tame Sky Bike felt like a scary potential death trap. This won’t be a huge let down. After the Sky Bike we headed for the Cavern Quest. We passed the Turbo Drop again on our way down. There was one solitary tourist on the ride. Mark wanted to join, but the ride had already started up. Cavern Quest is not part of the Brazilian Wushuzan Highland theme park. We had to get our hands stamped and leave the park. We walked to the Cavern Quest and paid 400 yen to enter. Cavern Quest is a maze. You walk through it looking for hidden doors and passage ways. You are supposed to get your ticket stamped at 3 check points in the maze, but the stamp machines did not work. Mark and I found 2 of our check points. Then we found a hidden passage and came to a room with 3 men. They were standing around touching the walls. They were stuck and couldn’t figure out how to get to the next room. What if I just yank on this? There was a door that opened just a little bit. I could peek into the next room, but that was all. The men could not figure out how to open the door the rest of the way, so they turned back. Mark tried pulling on things like some strings that were hanging from the ceiling. All that did was cause a window to fall out. “How do we know if we’re not understanding the puzzle, or if the puzzle is just broken?” he asked. “This dump? The puzzle is probably broken.” I huffed. I took another try at the door. I assumed that this was the door we needed to use. I pulled it open as far as it would go. Then I pulled harder. It moved a little more. I wedged myself in the door and pushed with all my strength. It opened all the way. Once in the room, the door started to slowly close behind me. “Mark, quickly!” Mark ran in and the door shut behind him. “Those guys turned back too soon!” We found our last non-working stamp machine and shortly after that, the last door. We headed back into the park for lunch. The posters advertised Brazilian food, but on the menu there were items like, “American Dog”, “French Fries”, “Chicken Nanban”, and other Japanese festival foods. There were somethings that looked like fat empanadas. We bought some of those. They were not empanadas. The dough was all wrong and there was broccoli inside. I’ve never been to Brazil so I can’t say for certain, but I don’t think broccoli is very Brazilian. The food was not good. It was greasy and cold like it had been made somewhere else, then brought here and reheated an hour before we bought our food. As we ate there were some Brazilians dancing on a stage as entertainment. They danced like they were being forced to and most people ignored them. They danced to the same 8 songs that played over and over again throughout the park. They dropped the “O” for savings. After lunch it was time for bingo. The Brazilians stopped dancing and called out numbers in Japanese. As soon as someone called, “Bingo” they were ushered to the stage to get a little trinket prize. There weren’t very many people playing bingo, so they kept calling numbers until everyone had won. After bingo, Mark and I went to the pool. Oh, yes! This Brazilian theme park is part water park. We swam for a few hours and went down the various water slides a couple hundred times. When we were completely exhausted we rinsed off and headed home. Tea Cups are not my friends. Overall the park was “not bad”. With the coupon the tickets were 2,300 yen. The pool was great. The rest of the park was okay. The food was horrible. (If I were to do it again, I would probably eat at one of the overpriced restaurants right outside the park.) 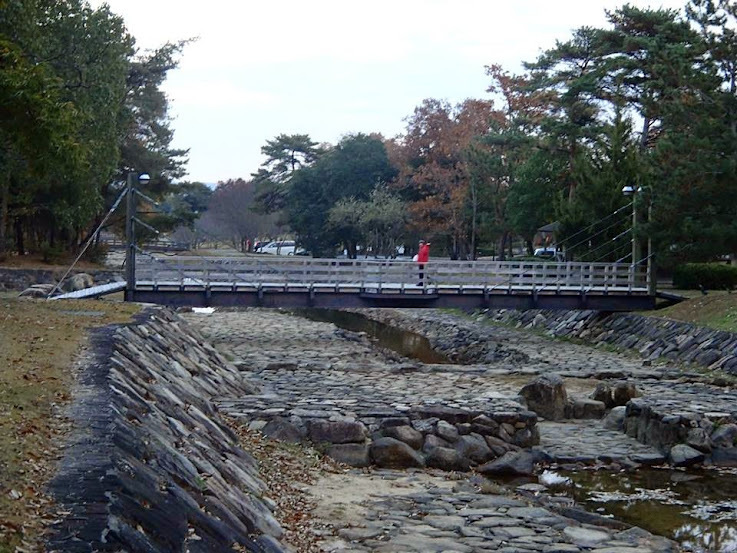 I wouldn’t recommend going to Okayama just for this park, but if you’re not too far away… why not? It was a great last day of summer. This theme park is very old and run down. With a coupon, it costs a little over $20 to get in. Don’t expect too much. The best part is, by far, the pool area. When Mark and I stayed at this campsite the year before, we saw that there were showers. We did not use them since they were all locked. It was mid-fall at the time, and we thought that that was the reason the showers were locked. (This sort of thing happens in Japan; the campsite is available year round, but some facilities like the showers are only unlocked from May to September.) So when our friend picked this campsite we gave no objections. We couldn’t find the onsen the strange caretaker told us about, but we managed to find a nice inexpensive one not too far from where we were. We got in and showered, even taking some time to soak for a few brief minutes before going to meet the South African friends of our South African friends. My delicate little flower… Mark. 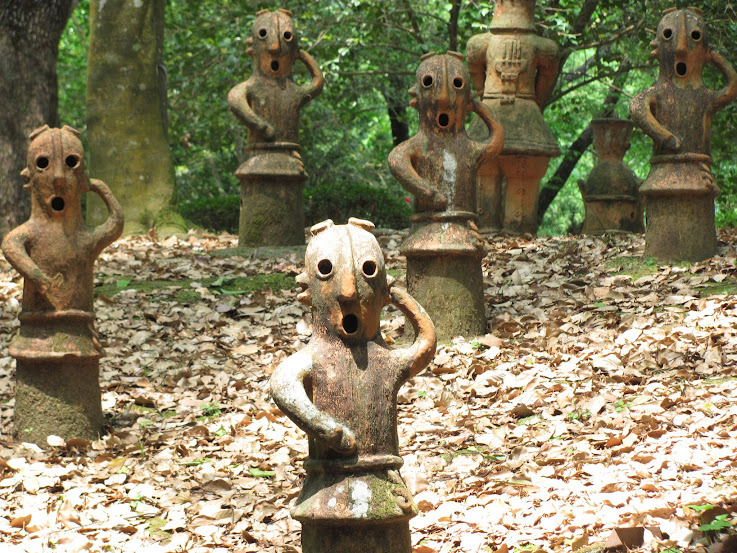 Mark and I had already seen everything that Okayama had to offer. We lived there for a whole 7 months. So, we really didn’t care what we saw that day. We were just happy to hang out with our old nerdy friends. I don’t know if this is their, or our, or both couple’s last year here in Japan. During the whole trip there was an ominous feeling of an end of an era. We all made hypothetical plans to meet up in some country or another to do one more camping trip, but who knows if that will actually happen. This is how life is for a wandering ex-pat. You make great friends, but everyone knows that one day you or they or both will move away, and you might see them rarely, if ever. Roland never stopped taking photos. We walked through the gardens and passed the castle. We never went into the castle itself, choosing instead to take photos of it from the garden. 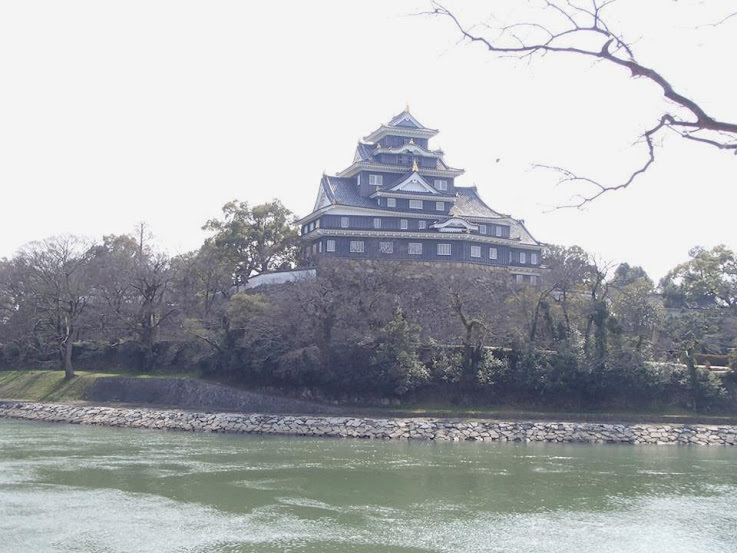 The best part of most Japanese castles are the photos of it from the outside. Guess where I got most of the great photos of this trip. 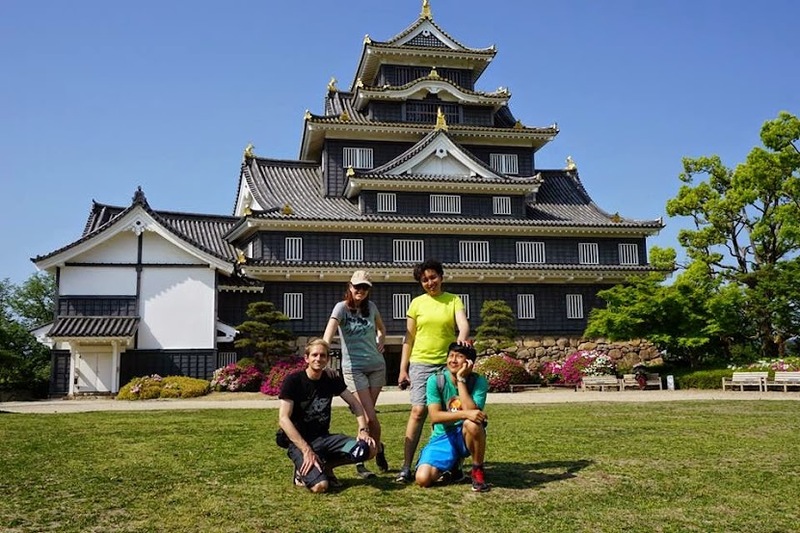 With nothing left to do in Okayama city, we headed to Kurashiki’s historic area. We walked along the canal. Our friends caught up with their friends and the six of us, 3 couples, moved through this romantic area. This town makes denim. Apparently, it is famous for it. There are many denim shops in the history area and one of them sells everything denim; from jeans and hats, to burgers and ice cream. Yup, ice cream! You can clearly see in the photo above a cone of denim ice cream, a denim burger, denim Chinese dumplings, and denim meat buns, which are all sold out. Mark and I could not pass up a chance to try denim soft serve ice cream. The denim burger, we could pass on; quite easily. The ice cream was actually flavored with the taste of the plain marble sodas that are common here in Japan. It was okay. That evening all 6 of us when back to the campsite for a grilled dinner. Only 4 of us spent the night at the camp grounds. The other two would join us at the next campsite. They had not done much camping before and this was their first camping trip in Japan. We would show them the rope. There is a persimmon grove where you can buy fruit in the fall. Take your trash home with you. You need to make reservations before hand. There is a water slide that you (if you’re super skinny) and your kids can use in the summer. There are showers, but they seem to never be unlocked. The toilets and non-flush and, depending where your camping spot it, a long walk from your tent. There is a ramen shop in the lobby area. Shampoo and body wash are provided. Prices vary when there are special exhibits. Parking is near the Garden. It costs 100 Yen/ hour. This town makes a lot of denim. 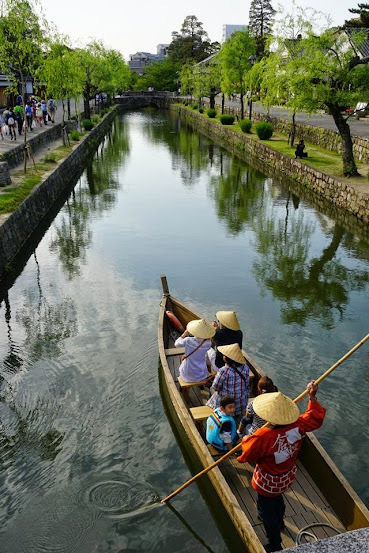 Kurashiki has a preserved Edo Period (1603-1867) canal area. There lots of shops in the historical district. There is also a pricey hotel in the Ivy Square area.